Daily pavilion concerts and entertainment, car parking on Fair grounds, daily Dinosaur Adventure, the Saturday 11am tractor pull, high school band shows, harness racing, livestock shows and Junior Fair sales. PLUS exhibits, barns, animals, horse shows and MORE! Rides are not included with gate admission, courtesy tickets, season passes or memberships. $10 Discounted ride wristbands all day on Kid’s Day. Rides are not included with free admission. Thank you for your service. Reserved seating tickets for ticketed grandstand concerts and events are available for sale online and at the Fair Office, located at the back of the grandstand. Event tickets do not include gate admission or rides. There is a convenience fee for each ticket. For wheelchair seating tickets at concert, tractor pulls, and demo derbies, please call the Fair Office at 330-452-0621 to order. The Progressive Stark County Fair welcomes large groups of visitors! Special gate admission pricing is available for groups of 12 visitors or more. For all kinds of groups including church groups, civic organizations, garden clubs, school groups, senior groups, family reunions and bus tours. Please call the fair office at 330-452-0621 for details. $13 – Wed., Aug 29, Come Early – Before 4pm and ride all night for $13. After 4pm $16. Tuesday, Wednesday & Thursday – Kiddie rides open at noon, Adult rides open at 3:00PM. Please note that there will be rolling safety breaks every day from 4– 6pm for 30 minutes. A daily list of safety breaks will be posted at the ride ticket booths. Wed., Aug. 29 Noon–10pm Come early – Before 4pm and ride ALL night for $13!! ON SALE NOW! Membership or exhibitor passes are required for entering items in the Fair. Available for purchase when entering online or at the Fair Office. All memberships and passes include gate admission and car parking on Fair grounds. Rides are not included. Unlimited entries. Members must be a resident of Stark County and 18 years or older as of January 1, 2017. Members are eligible to vote for Fair Board Directors. No farm or group names please. For out-of-county residents or for those 17 years old and under as of January 1, 2018. Unlimited entries. Allows entry to the fair ALL seven days. Special exhibitor pass price for participants 17 years old and under as of January 1, 2018. Unlimited entries in the Grange Building and Art Hall categories only. Special exhibitor pass price for entering a limited number of items in the Fair. Limited to five entries in Art Hall categories and five entries in Grange Building categories for a total of ten entries. Includes three gate admissions. Vendors may purchase daily gate admission passes for $5 for one gate admission and car parking on Fair grounds. Does not include rides or vendor parking area pass. Your Fair gate admission includes free car parking on the Fair grounds. The parking lots are located at the Wertz Avenue/Seventh Street and Wertz Avenue/Fourth Street gate entrances. 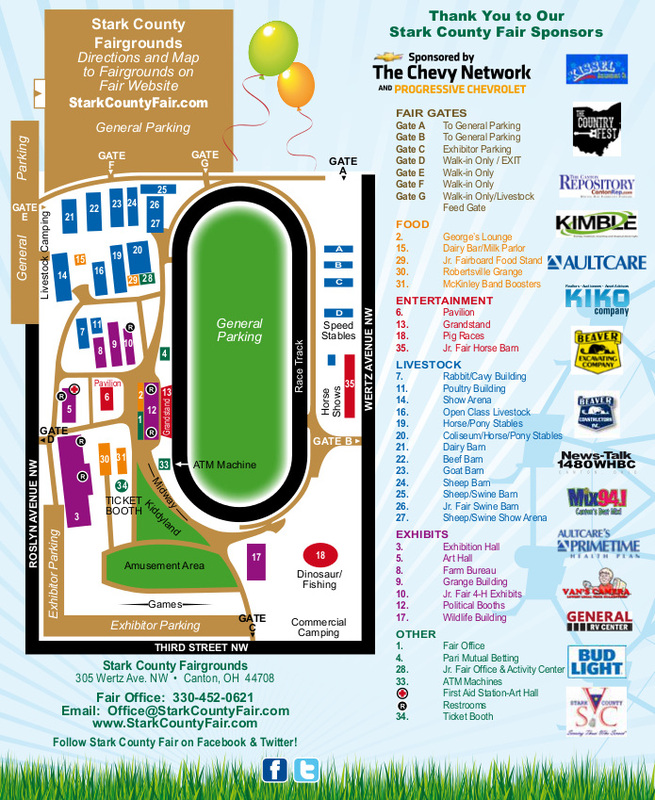 Vendor parking is at the Third Street entrance to the Fair with a special parking pass only. There is handicap parking available at the Wertz Avenue/Fourth Street gate and at the Wertz Avenue/Seventh Street gate entrances. The courtesy golf cart shuttle stops at both handicap parking areas. Wheelchair rentals are not available. Please contact the Fair Office at 330-452-0621 for more information. Courtesy golf cart shuttles run daily 10am–10pm from the parking areas to the Fair gates and inside the Fair grounds to select locations for Fair guests needing extra help. The Stark County Fairgrounds are conveniently located in the City of Canton, with easy access from I-77, US Route 30, US Route 62, and Tuscarawas Street. Take US Route 30 to I–77 North. Get off at Exit 105–Tuscarawas Street. Turn left and go to Wertz Avenue. Turn right on Wertz Avenue. The Fairgrounds is on the left. Enter at Wertz Avenue/Fourth Street gate or at Wertz Avenue/Seventh Street gate. Take US Route 62 to I-77 South. Get off on Exit 106-13th Street. Turn right at the end of the ramp. Go two traffic lights and turn left onto Wertz Avenue. Go through the first traffic light. The Fairgrounds is on the right. Enter at the Wertz Avenue/Seventh Street gate or at the second light, enter at the Wertz Avenue/ Fourth Street gate. Take I–77 South to Exit 106–13th Street. Turn right at the end of the ramp. Go two traffic lights and turn left onto Wertz Avenue. The Fairgrounds is on the right. Enter at the Wertz Avenue/Seventh Street gate or at the second light, enter at the Wertz Avenue/ Fourth Street gate. Take I–77 North to Exit 106–13th Street. Turn left at the end of the ramp. Go three traffic lights and turn left onto Wertz Avenue. Go through one traffic light. The Fairgrounds is on the right. Enter at Wertz Avenue and Seventh Street gate or at the second light, turn right at the Wertz Avenue and Fourth Street gate.